King George V | Enough of this Tomfoolery! The reign of King George V was marked by a world war and tumultuous change, not least in women’s fashions – hemlines went up, many women began to cut their hair short and corsets were gradually being abandoned for brassieres, reflecting the greater freedoms and opportunities women gained after the First World War. Greater disposable income, the expansion of the retail sector and the motion picture industry fuelled a boom in the demand for fashion, accessories and cosmetics on a greater scale than before 1914. Her style of dressing was dictated by his conservative prejudices; she was much more interested in fashion than most people imagined, and sometimes I think longed in secret to get away from the hats and dresses which were always associated with her. Having gifted with perfect legs, she once tentatively suggested to me in the nineteen-twenties that we might both shorten our skirts by a modest two or three inches but we lacked the courage to do it until eventually I volunteered to be the guinea pig. I appeared at Windsor one day in a slightly shorter dress than usual, the plan being that if His Majesty made no unfavourable comment the Queen would follow my example. King George V had none of his parents’ taste for fashionable clothing and being very conservative had a deep-seated loathing for change. James Pope-Hennessy in his authorised biography of Queen Mary detected that the King wanted things to be exactly as they were from his childhood and youth – so the “May” he proposed to should remain forever that “May” and so she deferred to her husband’s wishes. Even after his death in 1936, she remained wedded to the Edwardian styles that had long gone out of fashion. This became Queen Mary’s signature look. By day, she favoured tailored ensembles in dusky pastel colours accessorised with crown like toques (her experimentation with wide brimmed hats was also vetoed by George V), low heeled shoes and an umbrella clasped firmly in her hand. At night and especially for state and official occasions, she wore heavily beaded gowns in the same colours as her day wear and finished off with copious amounts of jewels. Observers noted that “because of her long, graceful neck, her height, her bearing and her instinctive flair for elegance, had always been able to display an extraordinary quantity of jewels on her person.” Upon her husband’s accession in 1910, her jewellery collection was bolstered by those pieces that Queen Victoria and Queen Alexandra designated as crown property and to be worn by a female sovereign or consort. Unlike her mother-in-law Queen Alexandra, Queen Mary had steadfastly always bought British. As Queen, her clothes were mostly made by Reville Ltd who was responsible for her coronation gown in 1911 and was appointed court dressmaker in 1910 and Madame Elizabeth Handley Seymour. Over the years both Reville and Handley Seymour would turn out variations of this signature look that led society diarist “Chips” Channon to describe her on different occasions as “regally majestic”, “looking like the Jungfrau, white and sparkling in the sun” and formidable in appearance “like talking to St Paul’s Cathedral”. Her signature look also allowed her to stand out from the crowd and as Norman Hartnell noted “looked well from a distance”, a winning formula that would be adapted by her successor, Queen Elizabeth and to this day remains the standard template for modern royal dressing. Succeeding to the throne in the wake of his brother King Edward VIII’s abdication, King George VI was far from a promising monarch – shy, stammering, not very intelligent and with a heavy smoking and drinking problem. However he had something in his arsenal that would make up for his shortcomings as king: a charming wife and two personable young daughters. While the bachelor Edward VIII gave up his throne for “the woman I love” here was the married George VI with a family that could help restore faith in the monarchy and royal family to a country shaken by the abdication crisis. “Us four”, as the king called his immediate family were the perfect model for stability and reassurance in a country still reeling from the effects of the Great Depression and the fretting over the gathering storm of the possibility of another war. And fashion again would be one tool to transmit the new king and queen’s message of stability to their subjects. When Lady Elizabeth Bowes-Lyon married the then Duke of York in 1923, she was the first female commoner to marry into the British royal family since Sarah Fairbrother married the Duke of Cambridge in 1847. In the wake of anti-German feeling during the First World War, King George V had changed the family surname from Saxe-Coburg-Gotha to Windsor and after the war broadened the pool in which royal princes could find suitable brides. 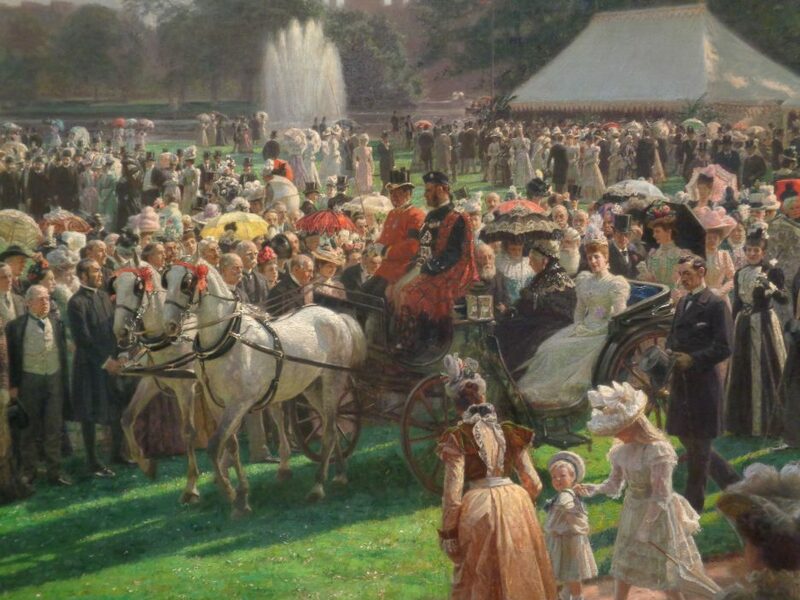 Instead of being restricted to princesses from other countries (they had to be Protestant), brides could now be chosen from the ranks of the British aristocracy. The new Duchess of York proved to be a popular addition to the royal family. Charming, adept at making people feel at ease and a good listener and communicator; she was dubbed the “Smiling Duchess” by the papers. Although she was not the typical flapper, her clothes as Duchess were very much of the 1920s – loose, low waisted dresses, cloche hats and fur trimmed coats, ropes of pearls and shoes with their mid heels and ankle straps. She could be described as “moderately fashionable” if dowdy – unsurprisingly as majority of her clothes were made by Madame Handley Seymour. Her image underwent a transformation when her husband unexpectedly succeeded to the throne. Conscious of the need to distance themselves from the short reign of King Edward VIII, Queen Elizabeth “conveyed notions of tradition, femininity and family mindedness” in contrast to the new Duchess of Windsor who was American and childless. However, Queen Elizabeth realised that she could never compete with the Duchess of Windsor (or even the Duchess of Kent) in terms of high fashion and chic and it’s highly doubtful that she even wanted to. In 1935, the then Duchess of York was introduced to a new designer Norman Hartnell who was making the wedding dress of Lady Alice Montagu-Douglas-Scott, the fiancée of her brother in law, the Duke of Gloucester and her bridal party which included Princesses Elizabeth and Margaret of York. His designs made an impression on the Duchess and upon becoming Queen, although Handley Seymour was still her chief designer she began to order a few clothes from this young designer who had his shop in Bruton Street. In 1938, Hartnell was given the commission to design the Queen’s entire wardrobe for the state visit to France. This would be the first overseas trip for the royal couple and a politically sensitive one at that given the looming possibility of another war. For Hartnell as well, this would be a challenge – how could he dress the Queen in a way that would impress a country whose fashion industry led the way and dictated trends across the globe? Again King George VI stepped in and gave Hartnell several ideas by taking him on a personal tour of the state apartments at Buckingham Palace particularly in the picture galleries. Hartnell was shown portraits of Empresses Eugenie of France and Elizabeth of Austria by Franz Xavier Winterhalter and suggested that perhaps they could serve as an inspiration for the gowns for the state visit. Although the visit was only for four days, thirty dresses were needed for the full programme of events from morning until night but just as the clothes were nearly ready, the Court went into mourning for the Queen’s mother the Countess of Strathmore. The visit would be postponed for a month but this gave Hartnell time to rework the clothes. As Hartnell recalled asking Queen Elizabeth, “Is not white a royal prerogative for mourning?” referring to the custom of Medieval and Renaissance queens wearing white for court mourning. This resulted into the famous “White Wardrobe” which would set the template for Queen Elizabeth’s look as queen consort and beyond. As mentioned earlier, Handley Seymour had taken Elizabeth’s love of soft and flowing fabrics as well as inspiration from paintings to create the clothes she wore as Duchess of York and her early years as Queen. However, it was Hartnell who took this one step further to help facilitate the final transformation from royal duchess to queen. The Winterhalter paintings served as the muse for the Queen Elizabeth’s evening look – grand embroidered crinolines that would serve as a backdrop for the magnificent jewels, orders and decorations that she would wear. It was a resounding success and demonstrated that not only could a British queen charm a normally ambivalent French public but that a British designer could hold his own against the Parisian couturiers who dominated and dictated to the fashion industry. Since Queen Elizabeth’s figure has become more matronly, Hartnell came up with an “uncluttered silhouette” to make her look taller and slimmer “with coordinating hats, gloves, bags and shoes. Her coats were usually designed without buttons or visible fastenings to be worn over fitted dresses, sometimes with embroidery or detailed work in the fabric.” Hats were also created in mind to ensure that her face was visible to the crowds and dresses and coats were also designed with unrestricted movement of arms in mind. This time I was not controlled in design by white monotone, but there were other problems including what may be called ‘dress diplomacy’. This is, of course, a development that has come with the rapid communications of our modern world, including the transfer of photographs by air and radio. The psychology of a vast public that may not always see the Queen in person has to be taken into account. For instance, should Her Majesty wear a magnificent dress of white satin and turquoise in Ottawa, she would not appear, even for an exactly similar occasion, in that same outfit in Montreal. The people of Montreal would expect a new and different dress and might consider it a slight if the Queen wore the Ottawa dress which they would have seen in their morning newspapers. So the task for the designer of a wardrobe for a State Visit is indeed a responsible one. For the prolonged tour I was most considerately given, from Buckingham Palace, a complete and detailed itinerary. For each day there would be six or seven occasions demanding a change in costume. Again the clothes were a success and Hartnell’s formula is one that not only has set the template for Queen Elizabeth’s look but also that of the present Queen and female members of the royal family. As demonstrated by the four royal women featured in this blog, royal dressing is more than fashion and style – it is also a tool of communication and more often than not would have more impact than a speech.